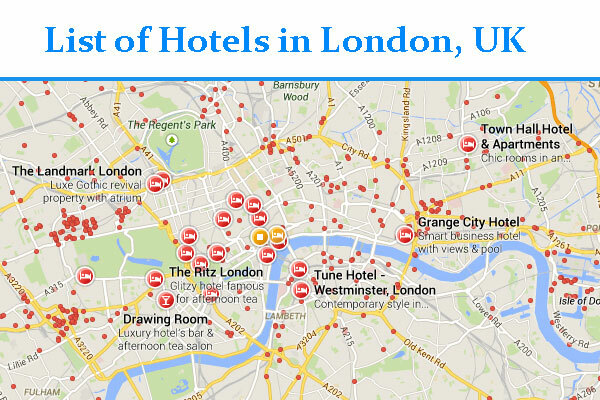 Find a List of Hotels in UK. List of hotels in London with address. St Giles Hotel In Bloomsbury, Central London. The Conference Centre features six modern and flexible conference rooms ideal for meetings, conferences, events, training and presentations. 4 star central London hotel. Perfect for business or leisure traveller. Walking Distance from Covent Garden, Holborn, Charing Cross, Waterloo and Embankment Underground Stations. Features includes affordable guestrooms, excellent restaurants, and flexible conference facilities. 372 Strand, London WC2R 0JJ, UK. Located in the Docklands area within 1.4 miles of London City Airport. Opposite the ExCeL Exhibition Centre, the DLR & 10 minutes from the Emirates Air Line, the O2, the Olympic Park, Westfield Shopping Centre & Canary Wharf. London E16 3BY, United Kingdom. Located near Paddington Station, Queensway and Bayswater Tube Stations in Central London. An affordable hotel in central London. Located in Earl’s Court area, in the Royal Borough of Kensington & Chelsea. 4 star hotel in London. A perfect base in fashionable Kensington. Conveniently adjacent to the Olympia London. With transport links straight to major attractions. Hop on a bus direct to Trafalgar Square. Located in Kensington, opposite Kensington Palace, The Milestone Hotel is a 5 star boutique hotel.